At Chatham-Kent Hospice, we provide compassionate end-of-life care to enhance the quality and dignity of life for those with a life limiting illness and their families. 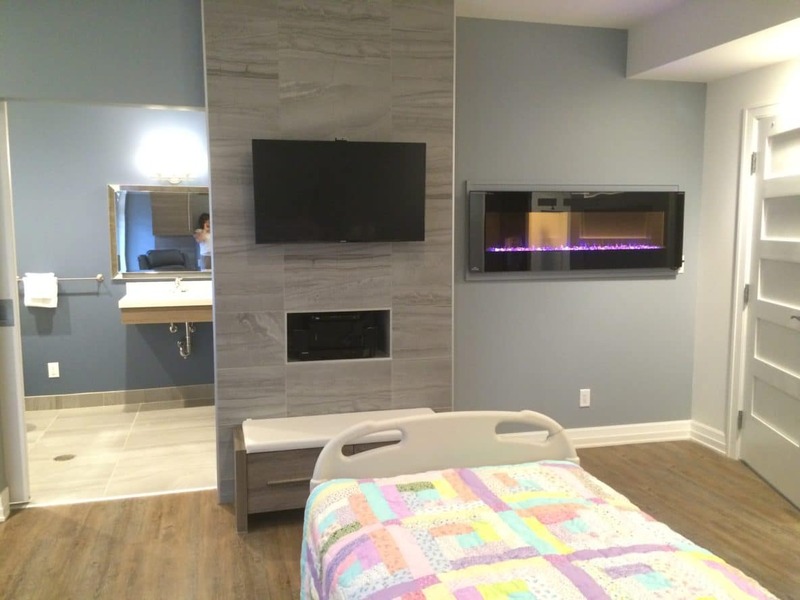 Our residential hospice offers 10 private suites designed to perform like a hospital but feel like home. Additional spaces in the hospice include bereavement support area, resource library, family gathering spaces, a reflection room, meeting rooms and a lovely courtyard. The palliative care team, providing 24 hour medical and supportive care, includes nurses, physicians, personal support workers and a spiritual care coordinator who along with volunteers provide a range of medical and support services. Hospice services are offered at no charge to residents or family, are culturally sensitive and provide whole person care. Our goal is to relieve pain and other symptoms while also meeting the psychological, social, cultural, emotional and spiritual needs of each resident and their family. Friends and family members are encouraged to visit with their loved ones at any time and to participate in their end-of-life care. The private suites offer a comfortable living space for family members and friends spend quality time with their loved one with the option for family to stay overnight when required. We welcome family and visitors 24 hours a day, 7 days a week. Visitors are asked to check in with the reception desk upon arrival and departure, so that we know who is in the building in case of emergencies. Pets are also welcome to visit. We ask that they have up-to-date Immunizations, be well groomed, and be of gentle temperament. Pets are to be supervised, on a leash or in a cage, and kept within the appropriate resident’s room. We ask that pet owners provide adequate food, water and outside bathroom trips – please poop & scoop! Sleeping area – The custom sofa and recliner chair serve as sleeping spaces for loved ones who are staying close by. Customized lighting – lights are located at the head of the bed so residents can independently control their preferred level of light. In-suite climate control – allowing those in the room to choose their preferred temperature as well as in-floor radiant heat. Concealed overhead lift system – to enable excellent medical care and support while maintaining a truly home-like environment. Call Bell System – a light-weight call bell resembling a wrist watch or pendant necklace. All meals are provided at no cost to residents. Resident mealtimes are flexible to meet the individual needs. Kitchen volunteers prepare resident meals according to their dietary needs and preferences where possible. Family members are welcome to bring in special meals that cannot be prepared at Hospice and stored in the refrigerator in the resident’s room. Meals brought from home may be warmed in the microwave in the refreshment areas. Full-meals are not provided for family members. We do however, supply soup, baked goods, treats, coffee and tea daily in the Great Room and Refreshment Area for family members at no cost. If anyone would like to make a donation to help offset the cost of food, a free will offering box is located in this area. Supermarket gift cards are also a great way to support the Hospice kitchen in purchasing supplies and a tax receipt is available if requested. Chatham-Kent Hospice can only accept donations of non-perishable foods and drinks that are well within their best before date, have their original labels and are not dented or damaged in anyway. This is to ensure that food safety is observed.